Jürgen Rigterink, First Vice President and Head of Client Services Group. Jürgen Rigterink oversees the Client Services Group which is comprised of the Banking and Policy & Partnerships departments. He has overall responsibility for implementation of Banking and Policy objectives, ensuring that EBRD investments, policy engagement and advisory services deliver the maximum transition impact in EBRD’s countries of operations. He chairs the Operations Committee which reviews all investment proposals (both debt and equity) before consideration by the Board of Directors and oversees the formulation of the Bank’s strategy to effectively and efficiently promote the transition of the countries of operations where the EBRD invests. 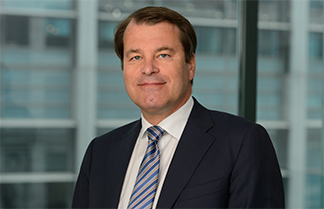 Before he came to the EBRD in 2018, Mr Rigterink was the Chief Executive Officer and Chairman of the Management Board of FMO, the Dutch Development Bank. Before his time at FMO, he worked in the private sector at ABN AMRO where he ran the company’s activities in Kazakhstan and held a number of senior positions including Sector Head of Central and Eastern Europe, Middle East and Africa.